Montreal is consistently rated as one of the world's most livable cities, was called "Canada's Cultural Capital" and recently was named a UNESCO City of Design. Old Montreal sits between the St Lawrence River and downtown Montreal. the St. Lawrence River, Rue Berri and Rue McGill. 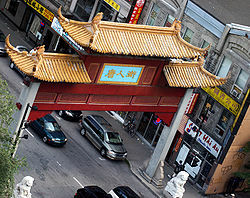 Chinese culture is well represented in Montreal, so Montreal’s chinese community has been established for many years. Immigrants came over initially to build the railway line towards the west and the community has grown ever since. Chinatown located just below Rene Levesque and centered on St. Laurent street. There is a hospital, many restaurants, and quite a few grocery stores and shops selling imported goods. Of course there are chinese supermarkets, and it’s very chinese with very little written skills in French, but a great variety of food. Little Italy - La Petite-Italie(French) - Piccola Italia (Italian)Montreal's Little Italy location: Saint Laurent Boulevard - between Jean-Talon and St. Zotique Streets. Montreal has the second largest Italian population in Canada after Toronto. 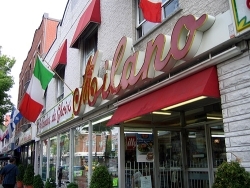 You will find many fine Italian shops and restaurants in the neighbourhood. Saint-Laurent Boulevard and Dante Street are lined with trattorias, cafés and shops. Jean-Talon Market is a huge fruit and vegetable market in building that was originally built to be a bus station. The Madonna della Defesa (Our Lady of Protection) church was built in 1919 and named to commemorate a miracle said to have occurred in 1898 in Casacalenda, Italy. Exceptional cappuccino, great food, soccer and Formula 1 fans that’s our Little Italy.